Out of the Régence there was to develop the most imaginative style of all, known as rocaille, or rococo, which differs essentially from baroque in its lightness and avoidance of symmetry. Rocaille, with its indulgence in caprice and fancy, was extensively employed by French craftsmen from around 1720 to 1755-60. Imagination is the basis of this decorative style, in which rocks and shells, with flowers and foliage, provide the dominant theme. Contrast and asymmetry are its essential features. From around 1730 the movement was expanded and accelerated by the work of such ornamentists as Gilles Marie Oppenord and Jules Aurèle Meissonnier, who were among the principal designers of these more extravagant forms. Fervent in his devotion to the rocaille is such a craftsman as Gaudreaux, who was one of the leading ébénistes in the employ of the Crown at this period. In the perfected or pure Louis XV style, dating from about 1750, the rocaille was subdued and simplifed, as the early harshness and agitation of its sinuous curves yielded to a more ample and tranquil rhythm. Freed from the exaggerations of the rocaille, the perfected Louis XV style featured a more moderate use of curved lines and less fanciful ornament. Craftsen working in this pure Louis XV style have given us perfect examples of French furniture at its finest. 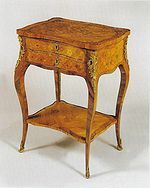 The most well-known ébéniste of the time is Oeben, whose apprentice was Riesener, perhaps the greatest craftsman working in the later Louis XVI style. Other famous names are Baumhauer, Lacroix, Dubois, Saunier, Leleu and B.V.R.B. The art of lodging people comfortably and privately, heretofore unknown, became of primary importance in the eighteenth century. The rooms were reduced to a more reasonable size, while the furniture became smaller, perfectly adapted to the human needs and, above all, more comfortable. Thanks to the improvement in mechanical devices, combination pieces came more and more into use. Multiple-function furniture, such as tables that could be transformed by complicated locking devices into toilet, writing, reading and sewing tables, is a notable feature. In chair design, each member seems to flow or melt into one another without any feeling of separation. The molded chair frames are often enhanced with rich floral, foliage and shell carvings. The most typical Louis XV chair is the bergère, a wide, low, and deep armchair. Canapés developed into a variety of types. One form, often called a marquise, is merely an enlarged armchair. The majority of canapés were made to accommodate three persons. In high fashion was the basket-shaped canapé, called canapé corbeille. The daybed was also given a variety of novel forms. Of these, the duchesse, distinguished by its gondola-shaped back, is most typical. In terms of beds, the lit à colonnes disappered. The shapes in high fashion were the lit à la duchess and the lit à la polonaise. Tables, which became simpler and lighter, have one characteristic in common, that is, cabriole legs. Medium-sized and small tables reveal all those brilliant and versatile qualities which marked the achievements of Parisian craftsmen of the golden age. Of infinite variety and with a legion to names, these elegant tables began to multiply from around 1750 onward. For the bedroom there were tables such as the vide-poche (pocket-emptier), the serre-bijoux (jewel-box tables) and chevets (bedside tables). For the boudoirs and the salons, there were small tables à ouvrages or work tables, called tricoteuses or chiffonnières. In writing furniture the ébénistes embodied with extraordinary felicity the temper and taste of France. 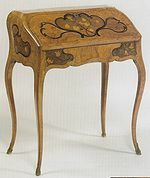 The simplest kind of Louis XV writing table is the large bureau plat. But the crowning glory was the bureau à cylindre introduced around the middle of the century and probably created by Oeben. Side by side with these large masculine bureaux, the craftsmen produced a variety of bureaux of the utmost refinement, with delicate marquetry and bronzes, for feminine use, such as the bonheur du jour. The tall and upright secrétaire with a drop front (abattant) and interior fitted with drawers was introduced around 1750. At the same time, a greatly increased variety of native and exotic woods were available to craftsmen. Thanks to this wide range of woods, pictorial marquetry began to flourish. It was most often in the form of floral decoration, but sometimes trophies, landscapes and realistic representations of domestic utensils. The enthusiasm for oriental lacquer inspired the ébénistes to adapt it to the decoration of furniture, by incorporating either imported panels or European copies into a bronze framework. The eighteenth century is the golden age for furniture mounted in chased and gilded bronze. From the middle of the eighteenth century, the craftsmen stamped their furniture – or at least were supposed to do so – under the marble top of commodes, on the underframing of chairs and tables or some similar place which would not mar the appearance. Already from the beginning of rocaille there was an undercurrent of protest in certain circles against asymmetry and the lavish use of sinuous curves, for it was felt they did not express the finer artistic instincts of the French, which were always inclined to moderation and restraint. Finally owing to the discoveries at Herculaneum and Pompeii, which resulted in an overwhelming enthusiasm for the antique, an evolution began around 1755-60, leading from the Louis XV style to the neo-classical Louis XVI style, which was established before the accession of that king in 1774. If you have an object you would like to sell corresponding to an era , click here!